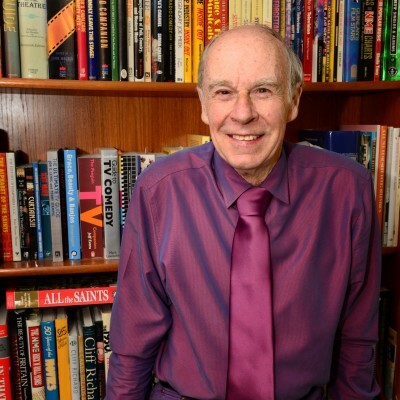 John Hannam has been interested in showbusiness and the theatre since the early 50s, when he first discovered Variety, at the Theatre Royal, Portsmouth. John began writing on showbusiness for local papers on the Isle of Wight, back in the late 50s. By the 70s he had a regular Stage Talk column in the Isle of Wight Weekly Post. He has written for The Stage for nearly 40 years. He also moved into radio in 1990, as a chat show host for Sony Gold Award winning Isle of Wight Radio, the South Coast station on 107 FM. John Hannam Meets is the longest running radio chat show in the country and is now into its 25th non-stop year. It can now also be heard worldwide via podcasts. Among the thousands of famous guests who have appeared are Sir Cliff Richard, Neil Sedaka, Kate Adie, Ken Dodd, Jeremy Irons, Susan Hampshire, Prince Edward, Victoria Wood, Charlton Heston, Sir John Mills, Bruce Forsyth, Sir Norman Wisdom, Sir Tim Rice, Dame Vera Lynn, Brenda Blethyn, Bradley Walsh, Sir Stirling Moss, Des O’Connor, Virginia McKenna, Honor Blackman, Christopher Biggins, Alan Rickman and Michael York. He was also invited to the set of Coronation Street to interview eight of the cast. John chooses his own guests and only interviews them because he really wants to – and not because of a programme controller or features editor. They are all in-person. His first book was I Was A Stage Door Johnny, with a foreword by Bob Monkhouse. His new 2018 book, the third in the John Hannam Interviews series, with a foreword by Craig Douglas,is called The Wight Connections and features the stories behind his interviews with Island people. Over the past 44 years John has interviewed around 5000 people.